Two portfolio holdings left the portfolio as of Friday close: Avanza Bank and Highpower International. The stock has performed very well lately, breaking the 400 SEK level which was something of a target for me in the medium term. The return in SEK has been 23% since April last year. Unfortunately the SEK has been very weak, so the return in USD +13%, still a good return but this shows the currency risk running a global USD denominated portfolio. I still think the company has a bright future in stealing market share from the big Nordic banks, but right now valuation has run a bit ahead of itself. I also believe that the retail speculation has reached a peak, especially in Sweden where small/micro cap stocks have been in mania mode for quite some time already. All the signs of a very late stage bull market is visible in my view and that is not the best time to own Avanza, although in a 10 year perspective I think the stock is still a strong buy. I take the bet I will be able to get in cheaper in the next few years. This has been in the portfolio since the beginning, although I cut the weight significantly a month later (happened to be same time as I bought Avanza Link). After reading sell side research I have understood that the ramp up in production of batteries, mainly in China, but also from Tesla’s Gigafactory will create a situation of serious supply surplus at least in the short term. Although I don’t fully agree with the analysts estimates of demand, they will probably be right for the short-term (1-3 years out). For the longer term I think the analysts underestimate the power of the S-curve demand, where consumers will move to EVs much faster than most people right now could imagine. But the over-supply situation could be deadly for small companies like Highpower and therefor I don’t deem the risk/reward favorable any longer. A part of the explanation for the S-curve move into EVs will also be thanks to this oversupply created, this will bring down prices of batteries rapidly and make EVs even more cost competitive. It has been a wild ride stock price wise in Highpower, but finally it is now sold at a minor loss. How about my other battery companies? If I have changed my view on battery companies, how about my holdings in Coslight Technology, LG Chem and BYD then? I have become more cautious and might reduce my holdings somewhat. The general answer is that I believe these companies are in a good position to be competitive for different reasons, also valuation wise especially Coslight is not expensive even if margins fall somewhat. Both companies are still eligible for government incentives. Coslight will just about qualify, which is a big positive. 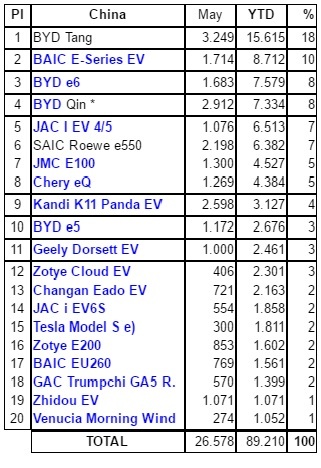 BYD EV sales is performing well and as important it’s sales of electric buses is still strong. The company continues to innovate and is now moving into the mono-rail market. Coslight has some very good companies it’s supplying batteries to: HP which has launched one of the worlds slimmest laptops with a Coslight battery in it. HP recently has issues with battery recalls from a supplier in China, but as far as I have been able to find, that was not related to Coslight. Coslight is also a supplier to car maker BAIC, which has during the last 6 months performed very well in sales of its EU260 car in China. It has launched another model which also started strong sales. ” Despite concerns about slower industry growth of EV in 2016 due to investigations into possible cheating related to government subsidies, management reiterated that EV battery production was fully booked, given strong downstream demand. 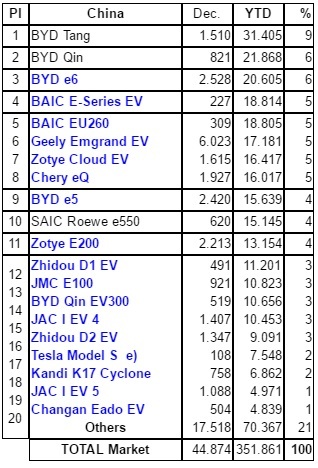 Coslight’s major customers for EV batteries in 1H 2016 were BAIC and XINDAYANG. This is my very long term holding, it is the industry leader and the producer of the very impressive Chevy Bolt. I expect LG chem being the number one battery producer to compete with Tesla’s Gigafactory and the future supplier to all the big car makers worldwide. Short term if the batteries are loss making is not of such importance since this company is mostly a Chemicals company with a smaller part of sales from batteries. This will change the day 50% of all new cars sold are EVs, then LG chem will rotate into becoming a huge battery producer. Thanks for the good comments in the previous post, a discussion I hope to keep going during 2017. It think it will take me quite a while to understand enough about such a complex field as DNA sequencing. And I probably wont feel comfortable to invest before I at least know a bit more. I’m sure this will be an important area for decades to come. What I find so enjoyable about stock picking and aiming for good returns, is that as part of the process I learn a lot about so many new fields. But no more talk about DNA today. Instead I want to talk about something totally different, which is a company fairly well know to me, but perhaps new for you? A company listed in Hongkong which runs a casino in Cambodia called Nagaworld. – Country risk high and risk of tax increases (currently at 5%). Nagacorp has been listed for about 10 years on the Hong Kong exchange. It is an easy company to understand as their line of business is running one large casino (Nagaworld) in Phnom Penh, the capital city of Cambodia. When building the casino they convinced the local government to give out a monopoly agreement where nobody else is allowed to open a casino in Phnom Penh for a period of 50 years, currently there is 41 years left in that contract. That’s one heck of a moat for gambling in the city. Stock performance over the 10 year period has been good, with regular high dividend payments (total of 2.15 HKD over 10 years). The stock has suffered quite a lot from dilution, both to the majority owner that has backed the expansion of the casino (more on that later) as well as private placements that normally has been done at steep discounts (10-20% disc). Cambodia is incredible poor, average monthly salaries in the city is in the 150 USD/month range, well below Vietnam where people earn in the 200 USD range. The Nagaworld hotel/casino is so big that it’s revenue contributes a somewhat staggering 23.5% to the Cambodian tourism sector GDP and 1.26% to total Cambodian GDP. 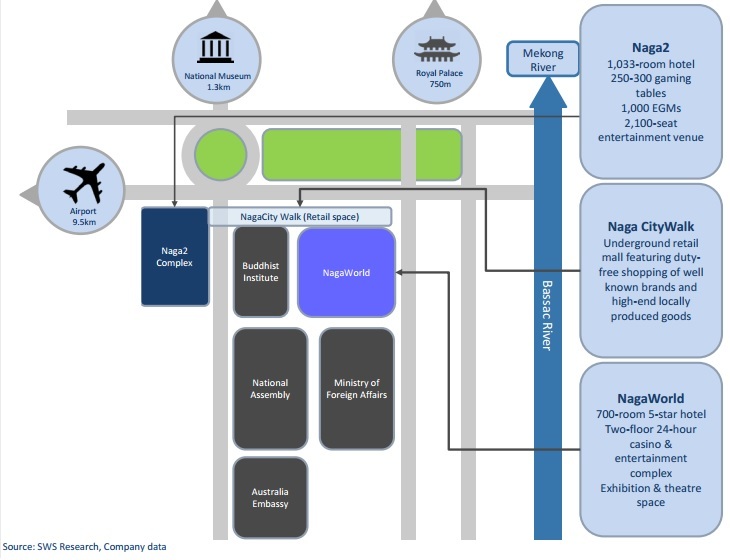 So analyzing futures prospects about Nagaworld is closely linked with future tourism for Cambodia. There are smaller casinos in southern Cambodia (where the ocean is). But Nagaworld is the only casino for tourist that visit the capital and/or going to the north to visit Angkor Wat, which is by far the most important tourist destination in Cambodia. For a first time tourist traveler in Cambodia, I would say 9 out of 10 is coming for Angkor Wat. I have myself visited the world heritage temples and it is definitely impressive, although I would not put it on top of anyone’s bucket list. Given that people in general like to travel to countries where they feel that they get a lot for their money, I would say Cambodia is pretty high up on that list. If you also consider safety, weather (maybe somewhat too hot in Cambodia), food, Cambodia is ranking even higher to the competition of low cost travel destinations. This is also shown in the tourist data, where the number of visiting tourist has trippled in the last 10 years. The growth has slowed somewhat in later years, but is still growing at a healthy rate 5-10% per year. 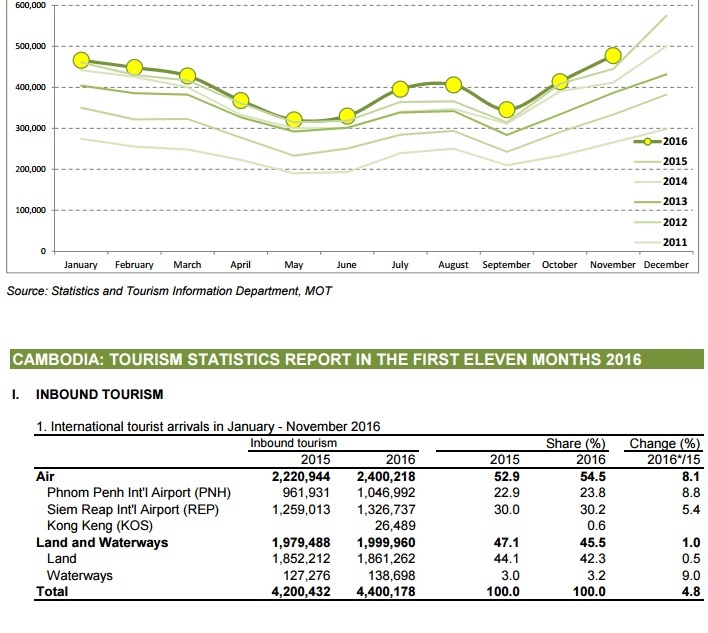 Without going through all the details of tourism (which can be found here Cambodia tourism statistics). It’s also the right type of tourist (for a casino) that has increasing visiting numbers. The number of visiting Chinese has increased with 16% over the last year. There are three main routes for tourist to visit Angkor Wat. 1. Flying to Siem Reap, which is a small city next to Angkor Wat and flying here directly saves some time if the purpose of the trip is just to visit the temples. 2. Flying to the capital Phnom Penh, spending a few nights here and taking a bus up through the country and visit Angkor Wat. 3. First visiting Vietnam (Ho Chi Minh) and then transfer by land to Phnom Penh and potentially on wards to Angkor Wat. As we can see from the statistics above there is healthy growth and the route through Phnom Penh is keeping a higher growth rate compared to Siem Reap. My guess is that the Siem Reap airport is closer to being saturated as it is a very small airport. Overall I’m bullish on tourism to Cambodia I think they will be able to keep up high single digit growth for many years to come, as it is one of few countries where Chinese people has a comparably much higher salary. As we will see later, another important group of tourist are the VIP players, or so to say high rollers. This I find harder to predict, as I don’t have as much insight into what destinations they prefer. From what I have managed to read, with the clampdown on excessive spending from the Chinese government, a lot of Chinese high rollers have moved from Macau to the coast of Vietnam. Casinos work very actively together with so called junket operators to bring in VIP players. In this arrangement there is a profit sharing between the junket operator and the Casino. This relationship with the junkets is very important for anyone running a casino in Asia. 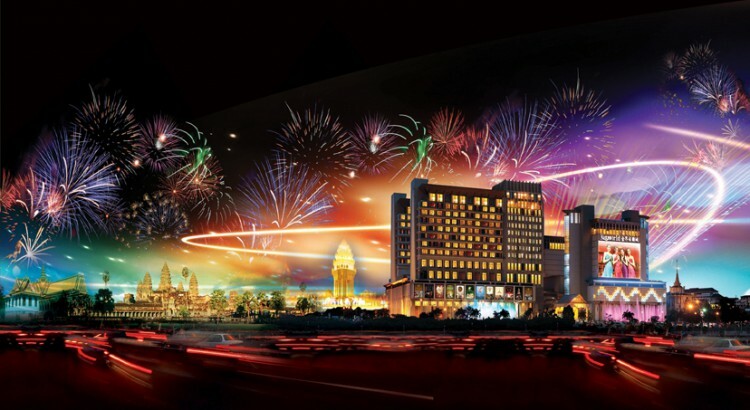 The Nagaworld casino has scaled up well and occupancy rates has climbed, in 2012 the decision was taken to expand the casino with a new building called Naga2. These two building were to be connected by an underground shopping walkway, NagaWalk. Instead of Nagacorp financing the project through capex this project was taken by the majority owner Chen Lip Keong. He funded the venture independently, via a special vehicle. Upon completion of the project, the properties was to be transferred to NagaCorp and the company will issue new shares and / or convertible bonds (see below about dilution). Just recently these projects were deemed completed, although the Naga2 hotel/casino is not fully up and running yet (to be fully operational during the year). This expansion effectively doubles the casino size in terms of rooms and gambling space for tables and machines. Another early stage project is an building of a new casino in Russia, in the same area as my other holding Summit Ascent Holding (A story about Asian gambling and how it came to Russia). Some analyst see this as an option with a positive PV. But I regard this project currently as neutral, there might be some future value in this project, but it also increases the risk, both in terms of project success, but also further share dilution to finance the project. Since I have owned this company in the past, I lived through some private placements that pissed me off big-time. First time this happend was in April 2012, the stock was trading in the 3.50 HKD range and a PP of 214 million shares was made at 3.04 HKD, the stock dropped and traded even below that level for a while. Later the same year a smaller PP of 90m shares was made, at that time investor interest was stronger after strong stock performance, it was placed at a small discount 4.50 vs 4.43 HKD per share. 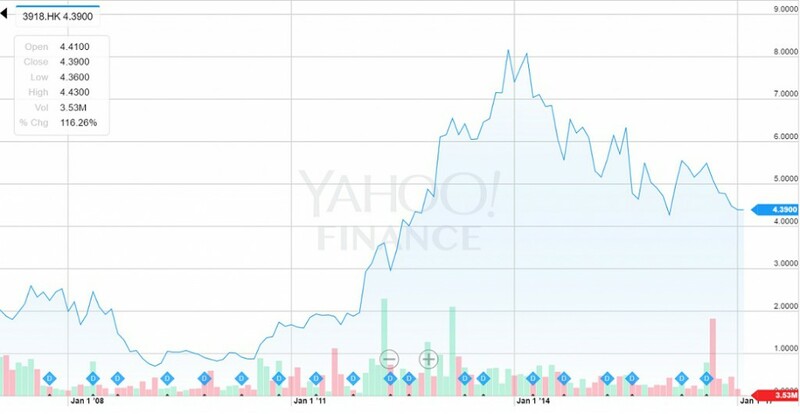 The next year in March 2013 the company was at it again, the stock was now trading at 6.60 HKD and another 200m shares were offered at 6.05. The latest offering was made in August 2016, where 190m shares were offered at 5.00 HKD with the stock trading at 5.50 HKD the previous days. All in all being a long term investor through these offerings, has not been as beneficial as if rights issues had been issued to existing shareholders. This shows how bad small investors can be treated when the stock exchange rules gives management a lot of freedom to allocate shares to larger funds who can buy in with 10% discount to current share price, which obviously gives extra dilution for an existing shareholder. I find this as a big negative in the history of this stock and I expect that this behavior will continue in the future. Another important factor of share dilution comes from the majority shareholder Chen Lip Keong, a Malaysian investor. As mentioned above he has financed the Naga2 expansion. When the ownership is now transferred to Nagacorp, the company as agreed issues convertible bonds to Chen Lip Keong, which are convertible at 1.53 HKD per share for a total of 1 881 million shares. This bonds are entitled to the same dividend as the ordinary shares. If converted it would increase the shares outstanding from current 2 460 million shares to a new total of 4 341 million shares. At the same time the conversion would give Nagacorp 2.88 billion HKD in cash. All this is highly hypothetical though, because converting the bonds would both financially be difficult for Keong, as well as force him to bid for the whole company as his shareholding would then increase over the limit according to exchange rules. He effectively including the bonds own 65% of the company. So all this is a clever way for Keong to own a majority of the company without invoking a forced bid for the whole company. This project has obviously given Keong a larger ownership of the company for a very cheap price, again diluting the ordinary investor. The benefit has been that Nagacorp has been able to operate at a debt free basis and it has also moved the risk of project completion from Nagacorp to Keong. I don’t think the transaction has been fishy, but definitely more beneficial for Keong than the other shareholders. So the new bigger Nagaworld + Naga2 complex, is it better for the shareholders than the hold casino? I would argue no, it would have been better for investors if the Naga2 was never built, but just continued milking the old Nagaworld complex, paying out nice dividends. This dilution has not been favorable for investors and that is also seen in the stock price, which peaked around 8 HKD and now trading at 4.40 per share. Current Op Margin: +38%, decreasing to 30% in 10 years. Revenue growth: 55% over the coming 2 years, accounting for the new Naga2 complex, after that 5% per year for 8 years. Terminal growth rate 1.9%. Cost of Capital: 14%, after 5 years decreasing to 12% to account for country risk moderation. Tax rate: 10% – right now 5%, but the company have to negotiate the tax every year, its likely to go up. I deduct cash from Present Value, including cash from Bond conversion, but also accounting for full dilution of bonds converted into shares. –> This gives me a value of 4.84 HKD per share, with the stock trading at 4.4 HKD per share currently, the discount is not huge, but this I also regard as conservative assumptions. Current Op Margin: +38% maintained indefinitely. Revenue growth: 80% over the coming 2 years, accounting for the new Naga2 complex, after that 5% per year for 8 years. Terminal growth rate 1.9%. Also to consider is the 70% pay-out ratio for dividends, my current estimate of the dividend yield at current stock price, is about 5.2% annual dividend. It’s not an ideal margin of safety, but the stock is offering a very attractive dividend yield and still good prospects for further growth, I’m initiating a small position here at 3% of the fund, and willing to buy more if we see the share price around 4.00 HKD. The last few months I struggled somewhat to keep up the posting, I clocked only one post in November and two in December. This is partly due to me moving back to Asia, but to be totally honest also a bit of writing fatigue from my side. Especially writing these performance/portfolio updates and the time it takes to update my Excel spreadsheets with the new NAV. It is fairly cumbersome to log all portfolio movements including corporate actions etc to replicate a full portfolio NAV. I started this post writing a year end update, but then I changed my mind. I did update my portfolio, so you can find all details under the Portfolio page, but I’m not going to spend more time reflecting on my past performance, it was good, but not great. So screw it, writing should be fun, not an obligation. Let’s talk about investment ideas and what I have been looking at the past few months, I will on focus on a new emerging theme in this post and will move on to more specific stuff in the coming posts. For those of you who have followed me for a while, know that I like to find themes with obvious tailwinds, winds that more or less prevail even though the general cycle turns south. Within that theme it then usually takes a considerable amount of time finding the right companies to invest in, and in most cases there are no ideal/perfect candidates. 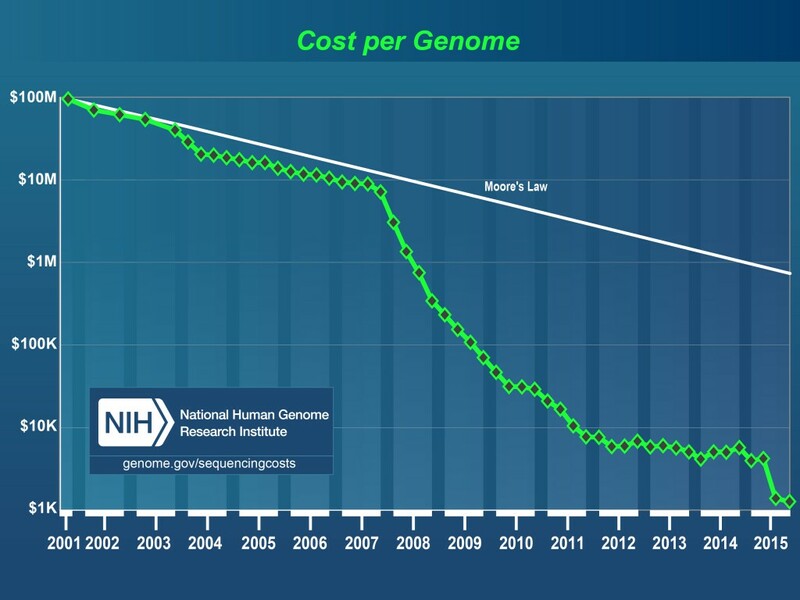 Something that I started to hear and read about a few years ago is how quickly the cost of sequencing a human beings full genome has come down. People knowledge on the topic takjed about that in a few years time, anybody would be able to afford sequencing their own genome. I thought it sounded cool but did not spend so much time looking into it. Then about a year ago I listened to a very inspirational speech about this, and realized this is going to be real in all of our lives very soon, just as we go to the dentist or any other routine check-up needed. This ties in very nicely with this new understanding of our DNA. First understanding our defects through sequencing, and then being able to edit out those defects. Also it should be mentioned that the possibility to analyze all of this genetic data becomes possible thanks to new big data technology and cloud storage. So 3 big technological fields together opens up a world of possibilities. All of this is fantastically interesting to me. Most likely this will affect all of our lives one way or another in the future. Could this also be a new investment theme for my portfolio? Just as with electric vehicles I will spend time during 2017 to educate myself on the topic and let’s see what emerges. Can we get a discussion going? I have not managed to get a discussion going here on the blog with those of you who read my posts, but if you have something to contribute on this topic, please do so. Genome sequencing field: Illumina (ILMN), Thermo Fisher (TMO), Qiagen (QGEN) and Myriad (MYGN).